This post is not original. I have written about this before, but the Trumpado strikes again. Last month, Donald Trump pulled the US out of the Paris Agreement. This foolish move was the clearest confirmation of his shallowness and his junky-like compulsion for attention. Well, he is getting it. While watching his speech about the US’s exit of the Paris Accord, I was shocked and disturbed – not entirely by the garbage pouring out of his mouth which we have all quickly got used to, but disturbed about how angry and agitated he was making me feel. It’s like every time he opens his mouth bullets of hate pour out of it, and even the kindest hearts are hit and filled with anger. Confused and intimidated by the intensity of my feelings, I realised that the impotence that amplifies all these emotions only snowballs with the idea that there is nothing we can do to strip him of power and to make him go away. This may all sound a bit intense, but I’m sure many share my same over-emotional experience. In fact, it seems like most of the world does. So much, that we are seeing a global phenomenon where anger is actually being catalysed for good. Something quite amazing began to happen after he delivered that cringe-worthy speech. It’s like he pressed the big red panic button which released a bucket of ice cold water over the heads of global leaders to wake them up. Trump ignored not only the science but also the 195 countries that support the Paris Accord. The global reaction has been unprecedented and unexpectedly reactive. Climate change is actually becoming political. Is it possible that Trump could be the unifying enemy that will bridge the world with solidarity? Could this nightmare actually be a blessing in disguise? Trump’s condescending call to the world asking to abandon the Accord which took over two decades of international cooperation, in order to develop a “better deal” for the US, has been widely shut down. Global leaders confirmed with great certainty that there will be no new deal, and the world is moving on with or without the Trump administration. And it seems like there is not much hesitation to leave Trump and his administration behind, not only by international leaders but also by the American people. Hundreds of cities, universities, and businesses across the United States have announced their commitment to meet the US’s pledge to the Paris Agreement (submitted during Obama’s administration), which pledges to reduce GHG emissions by 26% by 2025, compared to 2005 levels. This coalition of states, cities, businesses and academic institutions is being led by billionaire Michael Bloomberg, who has expressed great leadership and optimism that by doubling their climate efforts, the coalition could achieve and even surpass the US’s pledge. The group is even discussing the possibility of submitting their commitment to the United Nations as a replacement of the US’s national pledge, which poses an unconventional request since the Paris Accord is built only for countries members to United Nations Framework Convention on Climate Change (UNFCCC). However, the fact that this conversation is taking place between the coalition and the UNFCCC is an incredibly uplifting response, demonstrating global cooperation in the urgent search for solutions in favour of humanity. The development of this alternate pledge also presents a shift in the current norm of climate politics. This would mean a shift in leadership on climate change from the federal government to the local levels of government, to academia and industry. The state of California skipped over the federal government and has signed a deal with China on investment in clean energy innovations. Other cities such as New Orleans, New York, and Salt Lake City are amongst the many that have expressed their commitment to lead national policies on climate change. The rise of this political vertical interplay is a new ingredient into the mix of global cooperation on climate change. We are seeing a new concoction of strategies, solutions and collaborations. Even the biggest climate change culprits such as Exxon, Shell and BP have condemned the decision (even if just for good PR), and other big industries have pledged to stay in the Paris Accord because companies understand the risks of being left behind if they do not get on board. Environmental standards across the rest of the world will, in fact, become more rigid over time, and American companies will still have to meet these standards when selling their products abroad. The leadership and determination manifested across the United States to build a solar bridge over the mistakes of their federal government is an inspiring and relieving reminder that he is outnumbered. We – the humans with common sense, are more. The spotlight is shining brighter than ever on the major economies to ramp up their climate change mitigation efforts, and the EU is speaking out with great confidence that it will deliver. The Netherlands is well on its way to meet its 2020 target which cut emissions by 25% compared to 1990 levels, while Sweden has just passed a historic bill committing to becoming carbon neutral by 2045. Macron is starting off his presidency by positioning France as a strong global leader on climate change, affirming that France will go far and beyond their climate pledge. Only a few days ago Macron also announced that France would stop completely the granting of licenses for new oil and gas explorations. This is a bold and historic decision that will help make a sharp turn away from fossil fuels for France. The US’s exit of the Accord has also sparked a wave of international partnerships, with the European Union and China announcing their strategic alliance to lead the global transition to a renewable energy future, and France and India joining forces to mobilize more than a trillion dollars by 2030 to deliver solar energy to the poorest regions of the world. 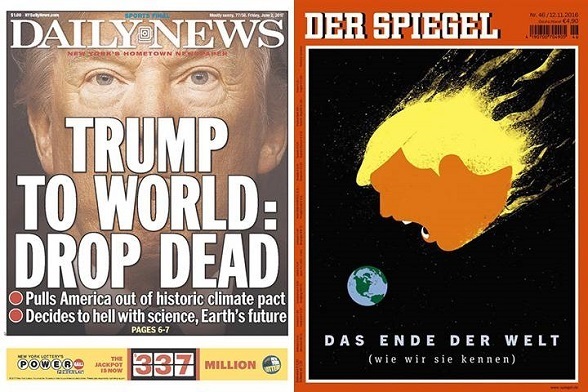 While the emergence of these alliances and growing sense of urgency to accelerate climate action is a positive global reaction, it is crucial that these public announcements become more than just reactive messages against Trump, and are actually followed through. The European Union must guarantee that the same leadership being exerted by some of its strongest Member States is replicated across the entire EU bloc. The European Union and its 28 Member States make up 12% of global GHG emissions, and ambitious EU policies are needed to effectively reduce these emissions. However, despite the global expectations, the European Union is not living up to the leadership role it is proclaiming internationally. This June affirmed the fate that lies ahead if the EU doesn’t take drastic measures to urgently cut GHG emissions. Western Europe was engulfed by staggeringly high temperatures that activated the emergency heat wave plans of France, the Netherlands and Switzerland. In Portugal, 64 people died in a forest fire, and in Spain, 1,500 people were forced to evacuate their homes. In light of the worsening climatic conditions, and the global responsibilities that lie upon the European Union to be a true climate leader, the EU should be embracing all opportunities to achieve and surpass its climate goals. In November 2016, the European Commission issued a set of legislative proposals to drive the European clean energy transition into a package titled, “Clean Energy Package.” The timely release of the legislative proposals that make up this package (proposing improvements to the Energy Efficiency Directive, Energy Performance of Building Directive, and Renewable Energy Directive) create a unique opportunity to pave the way for the European transition to a renewable future. These proposals are currently under revision, and the EU is committed to finalising the process by the end of 2018. However, environmental organisations are concerned with the direction that the revision of these directives is taking, as the Member States are determined to water down the ambition and make the energy targets indicative rather than legally binding. This package will play a significant role in the EU’s efforts to achieve its climate targets under the Paris Agreement. Improving energy efficiency would bring many benefits; from the reduction of GHG emissions and the simultaneous improvement in air quality, to economic and investment opportunities, to the creation of green jobs. If the EU wants to live up to its promises and galvanise international climate action to override Trump’s resistance, then setting the example by significantly improving these domestic policies must be the first step. The term “Trump-effect” has already been coined. Wikipedia defines it as the alleged increase in school bullying that took place in the United States caused by the rhetoric Donald Trump used during his 2016 presidential campaign…not good! But I would like to give it a different meaning, a positive meaning; because Trump doesn’t make me angry anymore. I am now hopeful that the intense and devastating emotions he transmits will be the fuel of the change we actually need, and that the “Trump-effect” will ignite a global race for who will be the greener hero. Cover Photo Credit: UNClimate Change Licence: CC BY-NC-ND 2.